My personal philosophy has always fallen in the middle of the two. I don't like the idea of writing a sponsored post just to get money, and I try to make sure my regular content heavily outweighs sponsored content. But I am also not against letting my blog work for me, and I don’t begrudge bloggers for doing sponsored posts every so often. After all, I spend a lot of time on this blog, and if I can get a bit of cash or some free stuff, I’m going to take advantage of it! There are a ton of blog posts out there about working with brands and how to make money blogging, so I’m probably not going to tell you something you don’t already know. That said, most of those posts are written by bloggers with followings in the thousands, if not tens or hundreds of thousands, and of course they are getting brands to work with them! It only makes sense. But there is room for those of us with smaller followings to utilize the magic of sponsorships. Later this month I have the opportunity to share about a couple of awesome products that I'm getting for free! I wanted to share a few tips and tricks to show you how I—a lifestyle blogger with a small following—approach brands and work with companies to either get free/discounted product in exchange for a review or a (small) amount of money that I use to pay for my morning donuts. I hope this is helpful to some of you who are interested in doing the same with your blog! Here’s the deal plain and simple: I’ve gotten some free products just by asking for them. 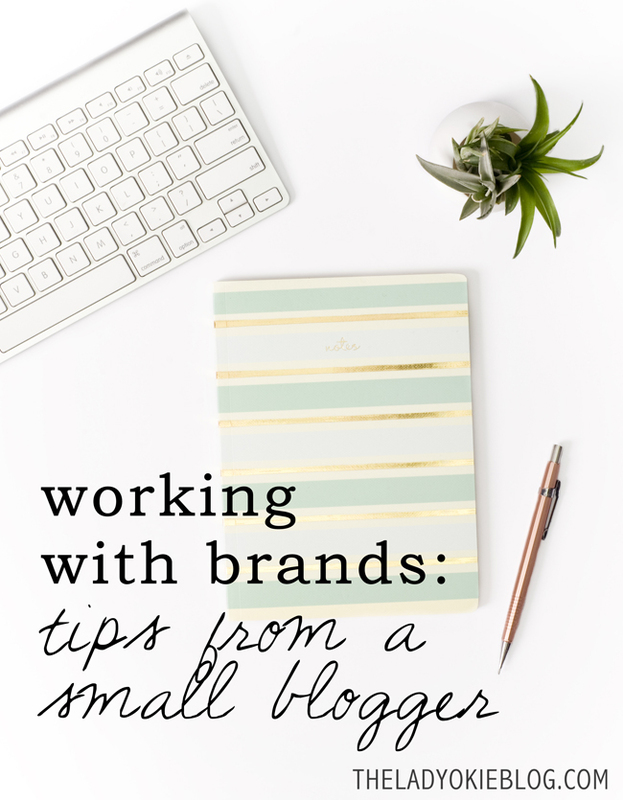 Don’t be afraid to approach a brand just because you have a small blog. The absolute worst thing they can say is either no or ignore you completely, and if that happens you have lost nothing at all. (And yes, it's happened to me.) But they could say yes, and if they do, you’re in! Most bloggers who know about these types of things will suggest you have a fancy media kit and a nice little form email to send out, and I am not saying that isn’t a good thing to have, but you don’t necessarily need it. Hello, my name is Amanda Bumgarner, and I am a lifestyle blogger based in Oklahoma City, Oklahoma. I am the owner of [insert blog URL], and I receive approximately [x # of pageviews] per month. I have a loyal and engaged readership, and I would love to share about [insert product] with them! I am interested in discussing a collaboration by way of a blog post with hi-res original images in exchange for [insert product]. In the past I have collaborated with brands such as [insert 2-3 brand names, ideally big names if possible]. Here are a few examples of past review posts: [insert direct links]. I look forward to hearing from you! Please let me know if you have any questions. It’s my opinion that the most important thing is to sound professional, mention details about your number of monthly pageviews or social media following, and tailor your email specifically to the brand. If I am approaching a brand who sells baby-related items, I mention that I am due with my second child and that many of my readers are new moms. Anything that will help show why you would be a good fit for this product and why your readers would enjoy hearing about it. Just one example: Last year I collaborated with Freshly Picked and got R a pair of moccasins in exchange for a blog post. I felt dumb asking because I thought I wasn’t a “big enough” blogger, but they were great to work with! I have also worked with brands who won't give me a product completely free, but I can buy it at a 50% or more discount, and that can be nice too depending on how much you are interested in spending. You can directly email companies yourself, but it can also be handy to be part of an influencer program, where the program contacts the brand and notifies you if you are a “match” for a particular collaboration. Usually you have to apply and be accepted based on how many other people want to receive the product, and sometimes there are specific qualifications to participate such as must have a child between the ages of 2-6 or must live in X city or must be under the age of 25, etc. Some bloggers are part of multiple influencer programs, and it’s really whatever works best for you. I am just involved with one: Linqia. (<<<< That is my referral link for the program, FYI. I get a few dollars if you sign up through it.). Through Linqia, I have gotten some awesome things like the MamaRoo Infant Seat and a free Shutterfly book. Oh, and this light, which Jordan is totally obsessed with. You have the option to decline a sponsored post, so they never make you do a post about something you don’t want to do a post about, and I have declined posts in the past. It’s all about your timeline and what works for your blog, which is why these types of programs can be fun to be part of because you can do as much or as little as you want. This is specifically for book lovers! Blogging for Books is a free program and totally awesome because hello, free books. I’m not explaining it any more than that. All you have to do is choose which book you want and they mail it to you! Then you write a review post about it when you’re done and post it on their website. There are other book review programs where you get free books, but this is the one I use. So far it hasn’t been worth it to me to do affiliate links where I share about a product and link back to a website and get a couple of cents if you buy it. First because I’m not totally sure how to actually do it, second because I’m not sure I’m cool enough to blog about things people actually want to buy for their own house, and third because I don’t really care to spend the time looking up links while I’m writing a blog post. However, you can make some easy money (a little bit of money, let’s not get crazy ideas) by joining referral programs. I have been getting the Graze box monthly for years, and I love it. Occasionally I will post about Graze and link to it using my referral code and get a free box for every ten or so people who sign up. (If you use my code, you can get your 1st and 5th boxes free!) I’ve also posted about the grocery rebate app called Ibotta (which is awesome), and if you sign up for the app using my referral link, I get a few dollars. It’s not much at all, but it’s a little something! This is extremely passive advertising where I literally do nothing and get about fifty cents a day. It’s embarrassingly little, but it adds up, and it’s fun to get a notification that there is money in my PayPal account. Those are just a few ways I get my blog to work for me by allowing me to work with brands and get free product or a little bit of cash. I have no illusions that I will ever have a giant following or make tons of money off my blog, and I’ll just be honest that I get rejected for sponsored posts probably as much as I am accepted. But, I just choose to focus on the free stuff I am getting and the opportunity to share about it with you! I know sponsored posts can be annoying, but I try to make sure it fits the standard and feel of The Lady Okie Blog, and I know that I personally have found out about some awesome things from sponsored posts of other bloggers. It’s also good experience trying to market yourself and work with companies, and I think of it as I literally have nothing to lose and everything to gain. I hope this has given you some ideas or maybe just some encouragement that free product isn’t just for the big bloggers! Even those of us on the smaller end of the blogging scale can get in on some of the action too, and you shouldn’t feel like you’re selling out if you do it. Best of luck! I agree about blogs where every post is sponsored. It's not personal at all. But I spend SO much time on my blog that I like getting some free stuff occasionally, usually on things I would have already wanted to buy anyway so it's really a win-win for me! That's fun you had someone sign up through your ipsy link! Thanks for the help! This is one of the more helpful sponsor posts I've read, from someone with a small blog who never does sponsored stuff. This is so helpful! Thanks for posting! I'll definitely be trying out some of your tips. This was really interesting and helpful! I agree, I don't read blogs who ONLY post sponsored posts, but if it's a blog I love that does a few sponsored posts here and there, I'm all about supporting that. I appreciate that the blogger spends so much time creating content that I like to read, so if they get paid for it once in a while, I think that's awesome. Definitely going to try out some of your tips!! If you hadn't worked with Copper Pearl and recommended them I would have never discovered their greatness! I have two sets of bibs, one set of burb clothes, and I two carseat/nursing covers (all purchased on sale of course!). I cannot help myself. Oh and a shark towel from my brother. Someone stop me. We haven't purchased a chair or swing for the babe, so curious to see if your little guy likes the Mamaroo! My husband works on SEO for a living and he's tried to teach me the difference between good SEO practices and bad regarding sponsored posts. It's still gray area for me, so I don't really participate in sponsored posts, use a lot of affiliate links, etc. But then again, just you and two other friends read my blog, so I don't exactly have a big enough audience to get to this stage yet. I definitely don't mind a sponsored post here and there if it FITS (key!) the feel of the blog or affiliate links if they are well marked as so. It's so obvious when a blogger is using a product just because it was free and otherwise would never care about it. Shutterfly and Mamaroo TOTALLY fit your blog, so I enjoyed those posts a lot! Very interesting read as the things that work for the big blogs might be different than the approach a small blogger would take. omg friend! You have so many good tips and I learned so much in this post. I have heard so much about ibotta, but need to look into it more. Thanks for that reminder! Thanks for sharing! I've given up my dreams of a "big-time" blogger, but lately, I've been thinking of doing little things here and there to see if I can make a little money off my hobby. I really appreciated your tips and links in this---already checking some of them out right now! Any blogger also gets a lot of people approaching them wanting them to do reviews/sponsored posts/letting them guest blog for products you have zero interest in. I usually say that I can't right now, but if they're interested in renting ad space in my sidebar I rent spots for $X per month. Most of them don't take me up on it but I've had a few that have! This post was awesome, Amanda! I could count on one hand the number of times I've been brave enough to contact a company about collaborating together...I typically just wait and hope they'll contact me lol. But one of my goals for this year was to be braver and more forward in chasing after collabs that I'm really excited about and want to participate in, so I'm going to use your email template as a good starting point. Thank you for sharing! I don't mind when bloggers do a sponsored post here or there or share affiliate links, as long as it is stuff you would assume they are interested or purchase anyways. I use Shop Style Collective to do affiliate links when I do my empties or favorites posts. I figure if I am going to share a link anyways, then it doesn't hurt to make two cents off of it. Haha. Love Blogging for Books and Netgalley. I work with them monthly reviewing books which is something I highly enjoy. I hate that companies want you to have thousands of views a day or month for the most part to get products because I feel like us smaller bloggers have better engagement with our readers. I will have to use your tip of contacting them instead of waiting to be contacted. I think that is genius! Thank you for this post!! It is so helpful, because as a tiny blogger, so many articles out there about getting sponsorships require at least 3 times the monthly pageviews I get. I did reach out to a company once, and I think they ignored me, but this post is definitely encouraging me to do that more-who knows if a company would say yes? Might as well ask away! I think that Blogging for Books is a great gateway into sponsorship stuff for small bloggers, because it seems like the process of signing on is very easy and approachable, and free books are awesome. I've gotten some great ones from Blogging for Books. And, I've noticed that since I started blogging more and more book reviews, I'll occasionally be contacted by authors offering me their books for review, which is cool too.